When we were younger, we were able to accomplish many of our tasks by pure will-power, having the strength and determination to make things happen by brute force. Even if there was an easier way, we didn’t want to waste the time over-thinking the task. So, with our impetuous behavior, we plunged ahead – often paying for our stubbornness by injuring ourselves, breaking something, and often experiencing very sore muscles the next day. Fast forward to the present day and to the modern science of workplace ergonomics. Looking at the definition of “ergonomics” in the Webster dictionary or Wikipedia, you will find a somewhat complex meaning of the word, but in simple terms it implies “doing the same amount of work with less effort”. To the crew on a refractory construction project or on the shop floor, less effort translates into more efficiency, productivity and safety. At times specialized tools such as mechanical assists, counter balance systems, adjustable height lift tables/workstations, and powered equipment might be needed to help in the ergonomics process, but not always. 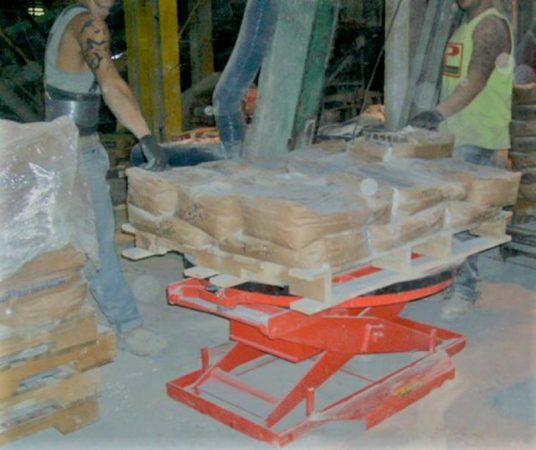 Ordinary items such as ropes and buckets can be used on the construction site in a simple way to move refractory supplies from one place to another, saving time and reducing the potential for back injuries. Refractory construction managers often find that manufacturing and processing equipment are not always placed in the most ideal locations. While these all-too-common situations can provide some head scratching moments, for those involved in refractory maintenance there are serious safety risks. Furnaces, boilers and smelters may be located with very little access by forklift or overhead crane, not to mention that the access doors to some processing equipment are barely large enough to pass supplies through, and debris out, during repairs. Hardly ideal. Chris Smith agrees that in the refractory construction industry, contractors do not always work with facilities that had the foresight to locate large processing equipment in a manner that facilitates easier servicing and maintenance. These devices can provide increases in project speed while reducing fatigue. Some industry members point out that the equipment does add cost to the overall budget, and it takes time to transport and set up. However, ergonomics pays for itself by reducing labor-hours, and difficult material handling issues. From the construction crew’s perspective, ergonomic tools and equipment do the heavy lifting for them, providing a better work environment, a more effective use of labor talent, and less pain at the end of the day. Ergonomics help transform difficult tasks into easier, safer ones by using smart tools and equipment. Done well, incorporating ergonomics into the construction process can help remove barriers to productivity. In today’s competitive refractories industry, it’s impossible to ignore the value ergonomics brings to the process of making the best product in the most efficient way.